At least six times a year, Don Copus gathers his Hungry Howie's employees for a corporate outing where you may find the Berkley, Mich.-based franchisee batting for one softball team, pitching for the other, or manning the grill. 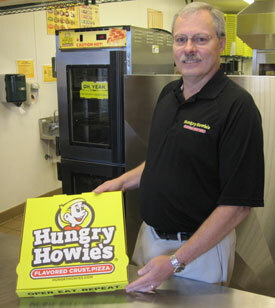 No matter how you slice it, Copus, named 2012 Hungry Howie's Franchisee of the Year, is an employees' employer. "I want them to know that I am approachable," says Copus. "I want them to realize that I'm no different from them. I started out with less than most of them, but worked hard to get where I am today. I want them to know that I'm willing to mentor them." A native of Indianapolis, Copus, who operates 25 Hungry Howie's in Michigan, Indiana, and Utah, grew up in a family of eight in a 900-square foot home, made cozier by parents who welcomed any neighborhood child in need of a meal or bed. Copus learned to problem-solve at an early age from his late father, who taught his son not to "cry over spilt milk" and, instead, focus on what you can do. "His family was his wealth," Copus says of his father, who died 31 years ago. "He always had a positive outlook on everything. We would say that if a strong wind would blow the roof off of our home, he would look up and say, 'It is sunny outside.'" His "can do" attitude has helped Copus over the years both personally and professionally, whether it was starting his franchising business in the middle of a recession or finding a way to rebuild the family home destroyed by fire--under budget and to twice its original size--when insurance money would cover only half the cost. An Indiana University graduate (and thus a huge Hoosiers fan) and certified public accountant, Copus has a nose for numbers that has enabled him to strategize and react quickly to economic and industry changes. He has served on Hungry Howie's Ad Council and as a representative of The American Pizza Community, a coalition of franchisors, franchisees, small operators, and suppliers who advocate for policies affecting the industry, including the successful reformation of menu labeling legislation. Over the past 21 years, his stores have earned numerous awards, particularly in sales achievement. 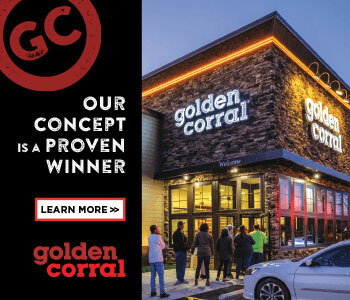 Still, says Copus, his recent Franchisee of the Year honor for best embracing Hungry Howie's brand concept and corporate philosophy of helping people was unexpected and puts him among a special group of franchisees that he has long known and respected. "All of this group, I believe, if cut, will bleed pizza sauce--I should say Hungry Howie's pizza sauce," says Copus. "It is this group of franchisees that motivates other franchisees to do better. They are Hungry Howie's ambassadors." Copus also believes the returns for reaching out to his employees and the communities his stores serve are abundant. For instance, when River Rouge, Mich., was slammed by tough economic times, Copus stuck with his restaurant, located near Detroit, and its community. His loyal diners, largely auto and steel workers, returned the favor. In 2011, that store boasted an annual sales increase of more than 70 percent, earning the unit the "Highest Percent of Sales Increase" award in the Hungry Howie's system. "Support your community and they community will support you," he says. Looking ahead, Copus has committed to adding six Hungry Howie's in Utah. He also operates two DJ's Hotdog Company locations, with plans to add a third Chicago-style hot dog eatery by the end of the first quarter. "I do want to make it clear that I would not be where I am today if it weren't for the dedication and commitment of my management team and employees," says Copus. "They are doing all the hard work. I'm just leading and delegating with some success." Company: Magna Services Group, Ltd.
Years in current position: Started Magna Services Group, Ltd. in 1995 with another Hungry Howie's Pizza franchisee to oversee the accounting and administration of our then nine franchises. Paper route, raking leaves, shoveling snow. I worked at various pizza shops during high school and college. Grew up on the east side of Indianapolis, a family of eight living in a 900-square-foot home with one bath. Both of my parents spent part of their youth growing up in orphanages. My parents did not have much, but were very giving. Our home was always open to neighbor kids who needed a place to sleep or a meal. If we did something wrong, we would be subjected to my father's lectures, which were usually a lot of questions to help us understand what we did and how it affected the people around us. He would make us look at our actions from many different points of views. This helped me develop a good skill set for problem-solving. Going to college (Indiana University), earning a degree in accounting and passing the CPA exam. Being married for 30 years and having four great children, two on their way to medical school and two in undergraduate schools. Most recently, I was named Hungry Howie's Franchisee of the Year. I accepted a job as director of finance and accounting for a $500 million company. Morale was terrible. It took me several months for my staff to open up to me. Then one day my boss came into my office and said that I needed to earn respect and that I needed to fire three people. I told him that he would have to fire me. Ultimately, I did not fire three people and he did not fire me, but about a year later my job was eliminated. At the time, my wife was pregnant with our third child and Southeast Michigan was in a recession. I spent 10 months looking for a job with no luck. It was at this time that I decided to buy myself a job. I looked at many different types of franchises and settled on Hungry Howie's Pizza for several reasons. I worked at pizza shops all through high school and college. Hungry Howie's had their "Flavored Crust" niche. I liked their products and was a customer at the location about half a mile from my home (now I am an owner of that store). They were the only franchisor that had me take a psychological profile test to see if I would be successful before asking me for any money. I signed for my first store in 1990 and lost money the first year, and I opened two more stores the next year. So really this wasn't a mistake, but it sure felt like it for the first few years. Sorry, but I don't dwell on what could have been. Always looking forward. Can't do anything about the past. 45 to 50 hours, usually, try to keep weekends open for family. Up at 6:30 a.m. Eat breakfast (very important) and get to the office around 8 a.m. Review prior day's sales, labors, and key statistics. As an accountant, I use this information to help guide my decisions: must control food and labor costs to make money; evaluate the effectiveness of our advertising and marketing. Boating, camping, fishing, spending time with my family and cooking. At least a half-hour walk daily. I am a sucker for spy novels. I just finished reading the sixth book in the Jason Bourne series. Work hard, but work smart. Don't dwell on things that you can't control. Don't look back, always look forward. To enjoy what I am doing. To help guide and develop my employees to reach their potential and achieve their goals. Family is very important to me. I will always make time for family. But I will always put in the time I think is necessary to get my businesses on target to achieve the goals I have set. 30-year wedding anniversary in Puerto Vallarta, Mexico. My father, who passed away 31 years ago. Be a leader. Treat people with respect. A happy employee is a good employee. Empower your employees. Give back to your community. Volunteer your time and resources to make a difference. Open-door policy. Work with your employees to mutually set goals and then give them the tools and help that is needed to reach these goals. Be positive. Staying positive during bad economic times. Hard working, takes charge, affable, fair, approachable, knowledgeable, caring, giving. But I am sure I have my critics too. We ask for suggestions on how to make our customers' experience better, how to improve our marketing and image. We want them to come up with ideas on "How to Wow" our customers, to provide customer service beyond expectations. Brand development and overall great advertising, marketing, and social media strategies. As a member of the Hungry Howie's Ad Council, I am fortunate to contribute to these endeavors. We are fortunate to have very few vendors. All of our food and paper products come from Hungry Howie's Distributing. They have done a tremendous job of controlling costs while reinforcing high standards from their suppliers. Yes. We've kept our budgets the same and, in some cases, we increased the amount we spend. We have shifted our spending away from blanket advertising toward more targeted advertising. This is more expensive, but the results are greatly improved. Social media can be a double-edged sword. It needs constant review. It is a great marketing tool if used with great care and honesty. The quickness with which information travels is amazing. We try to hire based on personality. We like outgoing people who like to engage our customers. We can train anyone on how to make a pizza, but it is really difficult to change an employee's personality. I strongly believe that after adequate training, if a person is not up to our standards, we must let them go or it will eventually lower existing employee performance morale. We train by explanation and physically showing them how to perform a function. Then, we have the trainee explain and show the trainer how to perform the function. We also explain why the function is necessary, and not that this is the way it is done. We also have training manuals and videos. We retain our employees by providing a great work environment and treating them with respect. We document all communications with employees, good or bad. With bad behavior, we explain the outcome if the behavior does not improve. If the outcome is termination, we let the employee know that they, in fact, terminated themselves because they knew what the outcome would be if the behavior continued. Always improve our PSI: Product, Service, Image. By increasing our customer counts. I'm 56 and would like to see myself taking a back seat from the day-to-day routine, but still be active in the overall business strategies. How is the economy affecting you, your employees, your customers? The last year and a half has been good, but the previous three to four years were hard. Customer counts were down, sales were way down, and costs (food, labor, gas, utilities, and insurance) were way up. Stores that used to make profits were losing money. I was fortunate to have many stores and was able to ride out the storm. Yes. The last year-and-a-half have been very positive for customer counts and sales increases. Profits are still sluggish because of costs. We looked at every line item in our profit-and-loss statements and found ways to decrease costs. We closed some stores that were losing too much money. We became lean and stronger. Capital is available, but it is extremely hard to get. Your debt load has to be low. Your global cash flows have to be very strong and you have to be extremely well-capitalized. If you have these things, then usually you don't need to borrow. For a lot of small businesses, asset financing companies might be a good resource. They are usually taking on more risks and, therefore, are charging interest rates north of 10 percent, which is high when you consider prime at 3.25. I have used local banks, national banks, and asset financing companies. I have not used private equity because of the reduced control I would have. We have employee outings at least six times a year. During the summer, we have stores compete against each other in softball. This is very popular. I usually grill food at the event, and I will pitch one inning and bat one inning for each team. This gives me a chance to meet my employees outside of the work environment and to show them that I am no different from them. We also have in-store contests and contests between stores for prizes and awards. We are just wrapping up a six-month contest where the winning store manager and guest and will spend an all-expense paid trip to Jamaica for a week. This is a tough one. We are still trying to figure out the cost of the Affordable Health Care Act. This will be very costly and I don't know yet how we will cover these costs. In addition to the above, we have an annual awards dinner. This is a work in process right now. I have a few ideas, but it is too early to discuss.